Scientists around the world are harnessing AI's data-mining ability in the fight against poverty. For good or bad, artificial intelligence has become ubiquitous. Thanks to AI, Amazon recommends items based on your browsing and purchase history. Facebook presents you with targeted ads after crawling your online profile and learning your behavior. And artificially intelligent smartphone apps respond to queries, recognize faces in photographs, and help you remember where you parked your car. But researchers don’t just see AI as a tool to predict and address our everyday needs. It can now be used to help solve some of the most important social and economic issues of our day. In fact, scientists are harnessing AI's data-mining ability in the fight against poverty—what the United Nations calls today’s greatest global challenge. Technology, in general, "puts us in a better position to solve issues we've never been able to solve," says Elisabeth Mason, founding director of the Stanford Poverty & Technology Lab, an incubator for technology-based solutions to poverty. But given the many causes of poverty—including lack of affordable local food, low levels of education and skills, natural disasters, and epidemics, to name a few — there's no "silver bullet" to tackling this issue, she says. Some researchers are using AI to pinpoint the regions most in need. Other scientists are integrating AI into research designed to improve agriculture, possibly giving the world's poorest farmers a way to elevate their financial status. AI is also an effective tool for increasing access to information and boosting education and literacy, among other things. "We are in a time of huge hope and huge risk," Mason says. "As a society, we make choices in what we invest in. So, what choices are we going to make?" Fixing poverty first requires knowing where it occurs. In many developed nations, household surveys and census data can be used to identify poor neighborhoods. But this information isn’t readily available in developing countries, including some in Africa and South Asia. What's more, gathering this kind of data on the ground can be slow, difficult, and prohibitively costly. The solution? Gather it from above. 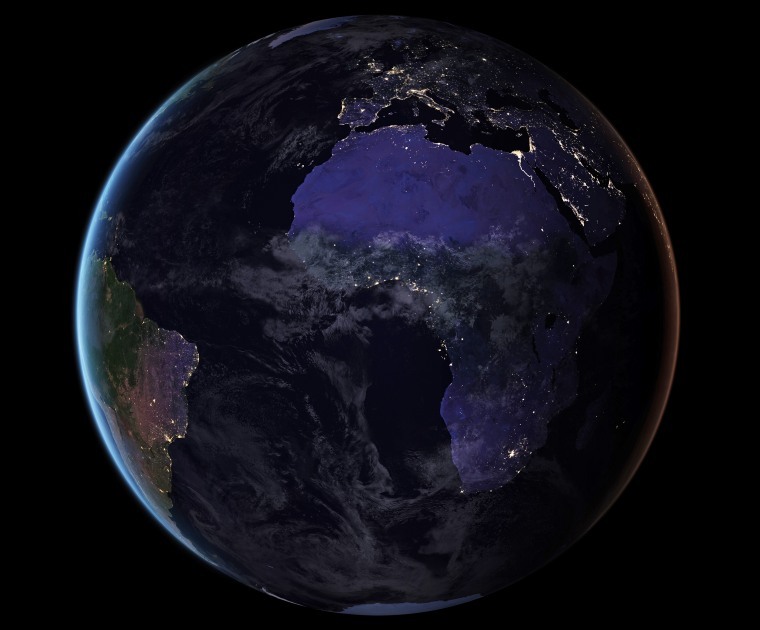 In recent years, scientists have leveraged the constant stream of photographs taken by satellites — particularly those that reveal the planet at night — to get a feel for global economic activity. Simply put: Regions that glow brightly tend to be wealthy. The problem with this approach is that these images can't be used to tell places of near-poverty from those of absolute poverty. In 2016, Stanford University economist Marshall Burke turned instead to daytime satellite images, using AI to fill the informational gaps. "Instead of us hand-curating the data and telling the computer what features to look for, we wanted to allow the computer to figure it out on its own," Burke says. Stanford researchers combine high-resolution satellite imagery with powerful machine learning algorithms to predict poverty in Nigeria, Uganda, Tanzania, Rwanda and Malawi.Neal Jean et al. The researchers then fed the computer the survey data and instructed it to predict the distribution of poverty throughout the countries. In all, the algorithm could predict poverty 81 percent to 99 percent more accurately than a nightlight-only model. With this kind of information, policy makers could monitor economic wellbeing in various parts of the world and evaluate the effectiveness of antipoverty programs, Burke says. The satellite imagery and AI could also be used to identify areas that require the most aid. While researchers like Burke want to pinpoint poverty-stricken areas, other scientists seek to give poor people the tools they need to lift themselves out of poverty. One such means is better agriculture. Global poverty and agriculture are intricately linked, with 65 percent of poor working adults making a living through agriculture, according to the World Bank. Investing in the agriculture sector is up to four times more effective in reducing poverty than investing in other economic sectors, making agricultural development a powerful poverty-reduction tool. Here in the U.S., selective crop breeding programs have ensured that valuable foods like corn and wheat are optimized to grow in our environment. "We're growing more corn every year," says George Kantor, a roboticist at Carnegie Mellon University in Pittsburgh. "But other parts of the world don't have that same trend." To address this issue, Kantor and his colleagues recently launched FarmView, a project that combines AI with robotics to improve the agricultural yield of certain staple crops, in particular sorghum. In developing countries like India, Nigeria, and Ethiopia, this drought- and heat-tolerant plant is a valuable cereal crop that has huge genetic potential thanks to its more than 40,000 varieties. To make the perfect crop with the right combination of disease resistance, nutrition, and yield, farmers must selectively combine different crop varieties to create new "children" crops to test. But keeping track of different seed strains and their individual attributes makes this process slow and time-consuming. Robots and AI can speed things up dramatically. Scientists are able to understand plant growth like never before, including the minute details of how genetics and environment affect plant characteristics and yield. "In Africa now, a breeder could be looking at maybe 100 varieties of sorghum a year," Kantor says. "We want increase that to 1,000." In Kantor's lab, four-wheeled robots drive through a field of sorghum plants, using cameras, laser sensors, and multispectral sensors to measure everything from the size and color of the plant to the nutritional content of its leaves, to signs of disease. The robots use AI to safely navigate by analyzing its field of view to differentiate between plants and soil. At the end of the growing season, Kantor and scientists at Clemson University in South Carolina will feed the massive amount of environmental, growth, and genetic data collected from hundreds of sorghum varieties into an AI model. By parsing the data for hidden patterns, the AI will help the scientists predict the yield of a particular variety based on early-season plant attributes or associate specific desirable traits with genetic markers. If this initiative is successful, the researchers could conduct similar trials in agriculture-heavy countries like Kenya, giving poor farmers the information they need to cultivate the most nutritionally packed crop of sorghum possible for their environment—at the highest possible yield. Using AI to find impoverished areas or improve agriculture techniques is just a start. Mason says there are dozens of other ways that AI can help alleviate poverty. For one, AI could help remedy the education deficits that many poor people experience. "Access to information has always been a big differentiator with poverty," Mason says. "If we can use the right tools and develop the right programs, we're looking at a different world." In places where children receive subpar education in schools (or no education at all), self-guided computer learning programs like Khan Academy — which, as its website describes, allows anyone to "learn anything" for free — can help, but there is room for improvement. If developers implemented AI into such programs, the tools could learn from and respond to users, adapting to their specific needs. And these programs could help even more people, Marson says, if they were translated to mobile platforms, which are slowly becoming universal. Artificial intelligence juggernaut IBM has its own approach to the information access problem. As part of its Science for Social Good initiative, IBM launched Overcoming Illiteracy, a project whose aim is to use AI to decode complex texts and convey them to adults with limited reading skills via visuals and simple spoken messages. And IBM's AI can help the poor in other ways, such as by predicting storm trajectories and tracking the spread of diseases, both of which hit poor communities especially hard. Of course, poverty affects developed nations like the U.S., too. And here AI could be used to tackle huge data sets involving the distribution of resources. For example, Mason says, AI could help determine if it's better for a struggling single mother to receive education, training, and food stamps or for her children to receive early childhood education and Medicaid. "There are hundreds more ways that AI could be useful that people aren't even trying to deploy yet," Mason says. But whatever AI tools governments, policy makers, and humanitarian organizations use, it's important to implement the technologies where they'll do the most good. "There's no question that the majority of our investments don't go to the poor and are instead to improve upper middle-class people to wealthy standards across the world," Mason says. "The real issue is that we're not making investments into the things that we should be if we really want to combat poverty."